This Gold Coast City Guide details the best experiences available for tourists, international students and working holiday makers on The Gold Coast. It details little known things to do, the Gold Coast suburbs, ransports, tips for finding housing and everything else useful that students or working holiday makers looking to move to the Gold Coast would find useful. The Gold Coast is one of the main tourist destinations in Australia. And it isn’t without a reason. The beaches are absolutely stunning, there is world class surf, vibrant night life, tropical climate and the cost of living is a lot cheaper than Sydney or Melbourne. The climate on The Gold Coast is also a major attractions to the coast. While the the rest of the world is shivering through winter, The Gold coast is blanketed in sunshine and warmth, and that’s just the beginning. Over the winter months the gold coast usually sits at about 20*C – 26*C (during the day) with very little wind and rain. And during the summer, the top temperature is usually around 30 – 32C. The whole year is the perfect time of year for out door activities such as bush walking,surfing,stand up paddle boarding & Fishing. If you are looking for a relaxing stroll through then you should consider Burleigh Heads. There is a path which follows along the rocky coast and tropical forrest of the headland. Almost along the entire coastline of the Gold Coast are walking paths. These are perfect for anyone looking to go for a run, walk or just looking to get outside. Tallebudgera Creek separates the suburbs of Burleigh and Palm Beach. At the mouth of the river is white sandy beaches. It is perfect for those looking to escape the swell of the ocean or if it is too windy at the beach. Currumbin Rock Pools are a locals secret and the perfect place to relax and take a swim in the Summer. 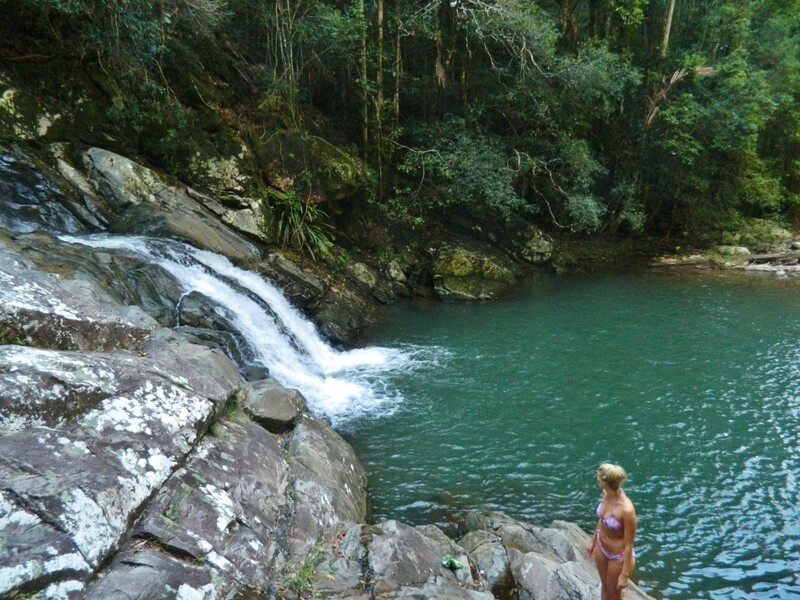 The pools are located in tropical rainforest of Currumbin Valley. Unfortunately the only way to get out to the rock pools is by car. The temperatures of the pools are significantly cooler than that of the ocean, so it is advisable to only go swimming between Oct – March. Mount Warning is a mountain located about 40 minutes south of The Gold Coast. You will walk through tropical rainforest on the way up and have a breathtaking view at the top. It takes about 2 hours to climb and about 90 minutes to descend. The climb can be somewhat strenuous, so only go if you are physically fit. Gold coast Titans are the Gold Coast’s team in the National Rugby League Competition. They play there home games at Skilled stadium which is located in Robina and very easy to get to with free public transport when you display a match day ticket. Skilled Stadium is conveniently located in Robina next to Robina train station and Robina town centre. The Gold coast Suns are Gold Coast’s team in the AFL. They play there home Games In Carrara which is about 10 Minutes from Surfers Paradise they also offer free public transport to the games and offer loads of family orientated activities on game day. The Springbrook glow worms are located in caves about 40 minutes from Surfers Paradise in Spring Brook National Park. Tour guides offer you a guided tour, however you can visit the caves by yourself. Located inland on the Gold Coast, Springbrook National Park is a great place to get away from the hustle and bustle of the city. The National Park has dozens of walking trails, waterfalls, caves and flora and fauna to check out. You are in the surf Mecca of Austalia (if not the world), so why not take part in a surf lesson. There are numerous locations to try this out including Snapper Rocks, The Currumbin Alley or Burleigh. The lessons generally run for a couple of hours and it is one in a fun group environment. No prior experience is required. Cavill Avenue is without a doubt the most popular street on all of The Gold Coast. Throughout the day it is packed with families and children, taking in the sites, restaurants and activities. At night it is packed with young adults going out to all of the many night clubs and bars. Q1 is the tallest residential building in the southern hemisphere. For a small fee you can visit the very top of the building. It provides amazing views of the entire Gold Coast and on a clear day you can see from Byron Bar to Brisbane. If you are interested in seeing some of Australia’s native animals then Currumbin Wildlife Sanctuary is an absolute must. The Sanctuary has Koalas, Kangaroos, Crocodiles, Emus, Dingos, Wombats plus many more native Australian animals. The Gold Coast is home to the most theme parks of anywhere in the Southern hemisphere. Dreamworld, Seaworld, Movie World, Wet n Wild are all located on the northern end of the Gold Coast. It takes about 30 minutes to get to the theme parks from Surfers Paradise. If you come all of this way then you may as well lie out in the sun and soak up some of the rays. 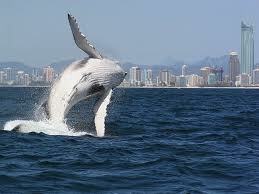 If you are really keen to see something special winter is the time that the whales migrate north. If you sit at any one of The Gold Coast beaches you can see these majestic creatures jumping and frolicking in the ocean. You could even go on guided whale watching tours. You may even be lucky enough to see Migaloo the white whale. Snapper Rocks is the home of the first stop of the World Surfing Tour. It is a world renowned surfing destination and can provide some great, clean right handers and long rides. However it is also one of the most popular surfing spots on The Coast so crowds can definitely be a problem. It is best in Southerly swell. Snapper Rocks is also the start of The Superbank. Which when it fires, connects Snapper all the way through to Kirra. There is rumours of well over 1 km rides. Kirra was once one of the best surf breaks in the world, however sand pumping, the emergence of Snapper Rocks and The Superbank and restructuring of the rock wall has resulted in unfavourable conditions in the last decade. However Kirra is one of the only places on The Gold Coast to hold large swells and it is common to see tow-ins when the swell is 5ft plus. It is best in south- south easterly swells. Located at the river mouth of Currumbin Creek, Currumbin Alley offers smooth, crumbling wave perfect for learning how to surf. It is also very popular among mal riders and stand up paddle boarders. The Alley can also handle large swells and fires in South-Easterly swell. Palm Beach is one of the best beach breaks on The Gold Coast. Because it is not a point break, it is a great place for surfers to escape the crowds. There are numerous rock walls and great sand banks which offer both right and left handers. 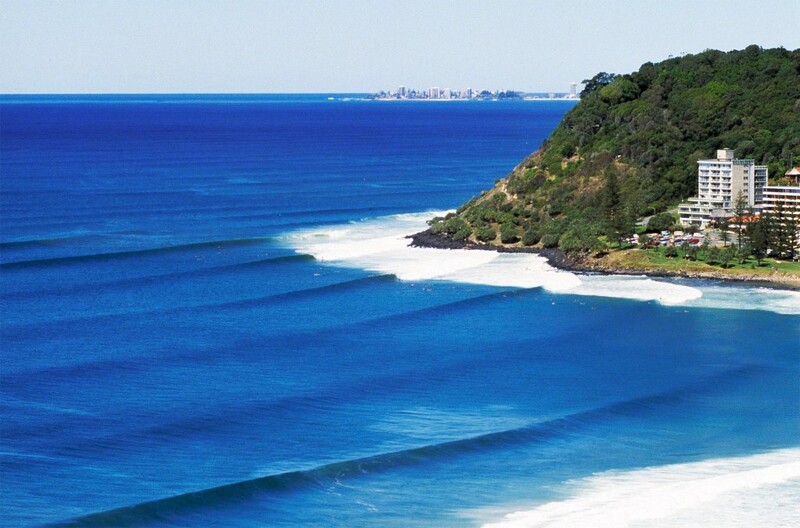 Burleigh is a picturesque, right handed point break that is know around the world for churning up barrels. It is protected from some winds by Burleigh headland and is can handle large swells. It is not the best place for learning how to surd as you will have to jump of the rocks to paddle out and crows can be a little overwhelming. South Stradbroke generally picks up the most swell of any spot on The Gold Coast. Located at the very southern end of The Gold Coast, surfers must paddle 250 metres across the Southport Seaway if they are willing to surf this spot. If you are keen enough to make the paddle, you will be surprised with the power of the waves and barrels. South Stradbroke is best in Westerly to North Westerly swell. Surfers Paradise is the tourist capital of the Gold Coast. Located on the coast on the northern end of The Gold Coast, Surfers Paradise is packed with hundreds of highrise buildings, restaurants, nightclubs and bars. Cavill Avenue is probably the most renowned street on the Gold Coast and is always packed with tourists and locals anytime of the day. Located on the northern end of The Gold Coast, Southport is one of the oldest suburbs on The Gold Coast and home to the majority of international schools on the Gold Coast. It is very close to Griffith University and also home to China Town and famed Education and migration Agency – Pathway to Aus. 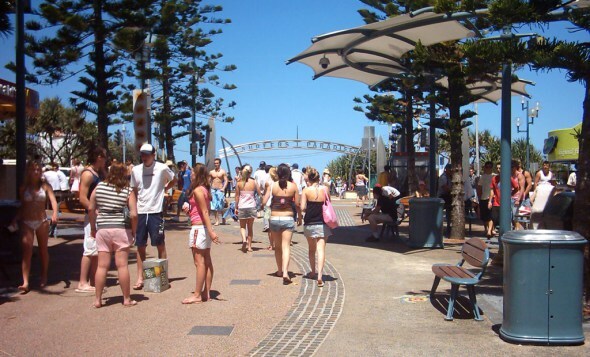 Burleigh is located in central Gold Coast and is becoming more popular with tourists. The major draw at Burleigh is the beach and headland, however there are dozens of great restaurants and coffee shops. Burleigh is a spot on the Gold Coast where locals go to take in the view and walk along the beach. Located at the very southern end of The Gold Coast and bordering with NSW, Coolangatta is a little more laid back then the northern end of the Gold Coast. There are amazing beaches and world class surf spots and still a few good pubs/bars to venture out. Located on the coast just south of Surfers Paradise, Broadbeach is fast becoming a hot spot on the Gold Coast. There are dozens of cafes, bars and restaurants to enjoy and the many night clubs give Broadbeach a popular night life. Located inland in central Gold Coast, Robina is home to the largest shopping centre on The Gold Coast – Robina Town Centre. It is predominantly a quite family suburb, but also a train stop connecting the Gold Coast and Brisbane. Universities – Griffith, Bond, Southern Cross University. Vocational – TAFE, Imagine Education,The Eagle Academy, Australian Wings Academy, EnviroTech International College, Academy Of Design. English Schools – Imagine Education, Gold Coast College, Shafston International College, Browns English Language School, Holmes Institute, English in Paradise, Langports, Australia International College Of Language(AICOL), Inforum Education Australia. Rental Costs: Generally speaking a room in a shared house will cost anywhere from $100 – $170 depending on where you are living and the duration of lease that you can sign. Located in Broadbeach this shopping centre is very conveniently located on the Gold Coast Highway. Robina Town Centre is the largest shopping centre on The Gold Coast. There are hundreds of clothing stores, restaurants, cinemas and grocery stores. Has plenty of high end retail stores for you to peruse. If you are looking to go out on the Gold Coast then there are plenty of places to go to. There are three main areas to go out on the Gold Coast – Surfers Paradise, Broadbeach and Coolangatta. Buses run up and down the Gold Coast Highway all night taking you to these destinations. Out of all the night hot spots on the Gold Coast, Surfers Paradise is by far the most popular. It is packed with dozens of bars and night clubs. located in Cavill Avenue, Surfers Paradise is one of the oldest and still most popular bars on the Gold Coast. It has a huge capacity, great drink deals, pool tables and live music. 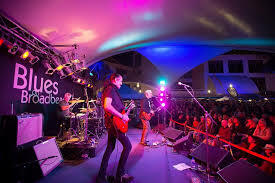 The best place to catch a live show is without a doubt the Coolangatta Hotel. Cheap: Hostels. There are dozens of hostels located around the Gold Coast with the majority in Surfers Paradise and a few in Coolangatta. Our pick is Coolangatta Sands Hostel, located minutes from the Snapper Rocks (one of the most popular surf beaches in all the world). The roads surrounding Main Beach and Surfers Paradise are closed down one weekend in October every year for this world renowned car race. If you aren’t into cars, then you might like the live music or just the amped up atmosphere that Indy brings to the Gold Coast. 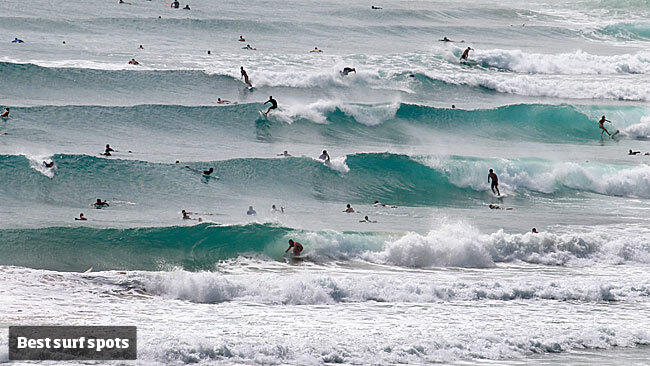 The first stop of the world surfing tour is held in early March at Snapper Rocks on the southern end of The Gold Coast. It is a free event and always a spectacle. Big Day Out music festival is one of the premier music festivals around Australia. Every year some of the tops act from all over the world converge on the Gold Coast to play this festival. The festival is held in Metricon Stadium, Carrara. Dust off your boots, trade your swag for swagger, grab your Stetson and sunscreen, and get ready for three days where Country meets the Coast. See some of Australia’s finest acts on outdoor stages and in venues throughout Broadbeach on the Gold Coast. You don’t need a ticket because this festival is free. If you love Rock ‘n’ roll, cars, dancing and live music then don’t miss the chance to be part of the most rockin’ event of the year! Cooly Rocks On is the new name for Australia’s hottest Rock ‘n’ roll and nostalgia car festival. The 10 day festival will showcase some of the biggest names in Rock ‘n’ roll, Rockabilly and Swing music, with over 50 bands and plenty of dancing. Enjoy a host of Australian and international artists on outdoor stages and in venues throughout Broadbeach. This multi award-winning festival is set to be bigger and better than ever before. Transport on the Gold Coast can sometimes be a problem for international students without a car. There are buses that run up and down the highway along the coast, however if you are looking at going inland then you might struggle. The G is a new tram system running from Broadbeach along the highway to Surfers Paradise, Southport and the out to Griffith University. There is a train that runs from Varsity (near Burleigh), stopping at Robina, Nerang, Helensvale, Coomera and up to Brisbane. This is the easiest way to get to Brisbane. It costs around $7 for a one way student ticket from the Gold Coast to Brisbane. Buses can take you from the coast to your closest train station. If it is late at night, then taxis may be your only way to get around the Gold Coast. Be aware Taxis on the Gold Coast are quite expensive. Buses run up and down the front coast highway. It takes roughly an hour to get from Surfers Paradise to the airport. Byron Bay is a beautiful coast town located about a 40 minute drive south of the Gold Coast. It is a very popular tourist destination with beautiful beaches, great food and laid back vibes. Buses can be caught from the Gold Coast to Byron Bay and back every day leaving from the Gold Coast airport.